Overview displays overview information, including activated devices, app registration users, faulty devices, and users’ feedback. The information helps you quickly master comprehensive indexes, for example, your smart products, OEM app, and utilization by consumers. Total activation: indicates the total number of activated devices with product IDs (PIDs) under the current Tuya account. A device is activated after it successfully accesses the network for the first time and is bound to the app. 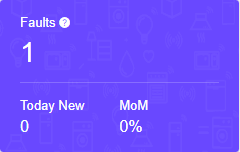 Today New (under Total activation): indicates the number of devices that accessed the network for the first time and were bound to the app on the current day. If the value is negative, the minus sign (–) is replaced by a down arrow icon; if the value is positive, an up arrow icon is displayed in front of the value. App Registrations: indicates the total number of users who have registered with the app that is associated with the current Tuya account. Today New (under App Registrations): indicates the number of users who have registered with the app that is associated with the current Tuya account on the current day. Faults: indicates the total number of reported faults that have occurred on devices under the current Tuya account. Today New (under Faults): indicates the number of faults that have occurred on devices under the current Tuya account and were reported on the current day. Feedbacks: indicates the number of times that users report feedback through the app associated with the current Tuya account. Today New (under Feedbacks): indicates the number of times that users report feedback through the app associated with the current Tuya account on the current day. Devices activation chart: shows the trends for devices activated daily over a specified time. App Registration chart: shows the trends for daily registrations with the app associated with the current Tuya account over a specified time. Faults chart: shows the trends for daily reported device faults over a specified time. Feedbacks chart: shows the trends for daily app user feedback over a specified time. Devices Analytic displays device statistics, including information about device activation, frequency of device use, function use, and device locations. The device statistics help you understand how many smart products received by consumers have been activated, which functions are frequently used, and where devices are used. Devices activation today: indicates the number of devices that accessed the network for the first time and were bound to the app on the current day. Devices activation yesterday: indicates the number of devices that accessed the network for the first time and were bound to the app on the previous day. Total activation: indicates the total number of activated devices with PIDs under the current Tuya account. Devices active today: indicates the number of online devices for the current day. Devices active yesterday: indicates the number of online devices for the previous day. Devices activation chart: shows the trends for devices activated and bound each day over a specified time. Active Devices chart: shows the trends for daily online devices over a specified time. Distributed Region histogram: shows the number of active devices in 20 prefecture-level cities and other cities within a specified time. Activation indicates successful network configuration of a device that the consumer who purchased the device is using for the first time. Activation Data displays information about the sales and initial use of devices. Activation in recent 7 days: indicates the total number of devices that were activated in the past seven days (excluding the current day). Activation in last 7 days: indicates the total number of devices that were activated during the week before the past week. Daily Activation Trend chart: shows the trends for devices activated and bound each day over a specified time. Total Activation chart: shows the trends for the number of cumulative activated devices for each day within a specified time. An active device interacts with the cloud. Activity Data displays information about consumers’ use of devices. Devices active today: indicates the number of active devices for the current day. Devices active yesterday: indicates the number of active devices for the previous day. Devices active in recent 7 days: indicates the number of active devices for the past seven days (excluding the current day). Devices active in last 7 days: indicates the number of devices active during the week before the past week. Activity Trends chart: shows the trends for daily active devices over a specified time. 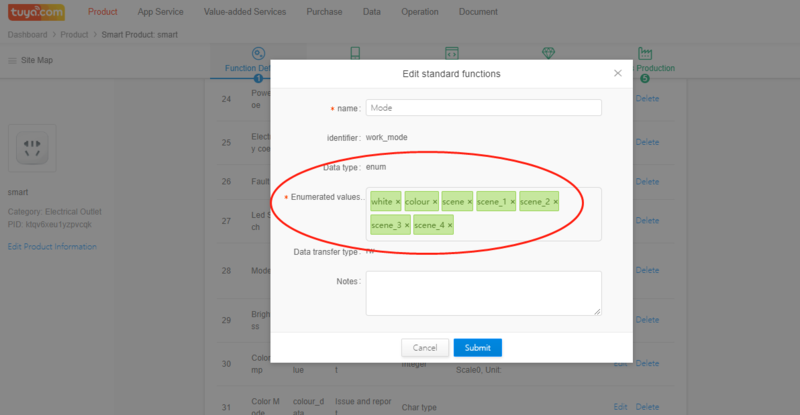 Functions Analytic displays the utilization rate of product functions. The information helps you understand the functions that are frequently used or unused, so that you can efficiently optimize your products. For example, you may need to optimize the airflow direction adjustment function of the smart heater if the function analytics show that the utilization rate of this function is only 5%. The use frequency of a product function (DP) indicates the number of times that the function is used. Regional Distribution displays areas where devices are activated or used, helping you understand the product sales distribution and supporting marketing. For example, if the device use distribution map shows that a product is most used in Nanjing, you can focus promotion of the product in Nanjing. Detailed Regional Distribution Data: lists the number and percentage of active or activated devices in each province or prefecture-level city. APP Registrations displays information about the users who register with your OEM app and active users. The information helps you understand how frequently consumers use your app and their usage habits, assisting you in improving the app and user experience. For example, if the number of users using your app on weekends is twice that on weekdays, you can carry out user operations and push marketing ads during weekends. Active today: indicates the number of active app users (who request cloud APIs) for the current day. Active yesterday: indicates the number of active app users for the previous day. Registered today: indicates the number of users who registered an app account on the current day. Registered yesterday: indicates the number of users who registered an app account on the previous day. Total Registrations: indicates the total number of registered users. Users Registration trend chart: shows the trends for daily user registrations over a specified time. Users Activity Trends chart: shows the trends for daily active users over a specified time. Devices activation today: indicates the number of devices that were activated through the app for the first time on the current day. Activation in recent 7 days: indicates the total number of devices that were activated for the first time through the app in the past seven days (excluding the current day). 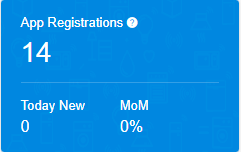 Activation in last 7 days: indicates the total number of devices that were activated for the first time through the app during the week before the past week. Active in recent 7 days: indicates the number of online devices for the past seven days (excluding the current day). Active in last 7 days: indicates the number of online devices for the week before the past week. Total activation: indicates the total number of devices that have been bound to the app. Product quantity: indicates the number of products to which the devices bound to the app belong. Product Distribution pie chart: shows percentages of devices bound to the app. Statistics about a maximum of 20 products with the most devices bound to the app are calculated and displayed. The Devices Activation Trends chart shows the trends for daily bound devices over a specified time. The Device Active Trends chart shows the trends for daily active devices over a specified time. Note: If a device was active during the past seven days and the seven days before that, the device is counted in either Active in recent 7 days or Active in last 7 days. The single count mode is incorrect and will be modified to a double count mode. Faults Analytic shows statistics including the number of faulty devices and fault distribution. These statistics help you understand which faults are commonly found on the products for sale and which fault reporting types need optimizing, so that you can quickly locate product problems and effectively optimize products. For example, if the Faults chart shows that a large number of faulty smart electric kettles have been reported, you can check the fault distribution chart to locate causes of the faults; for example, you may find that the faults are caused by faulty sensor or high temperatures. Total Faults: indicates the total number of reported faults that have occurred on devices under the current Tuya account. Today New: indicates the number of faults that have occurred on devices under the current Tuya account and were reported on the current day. 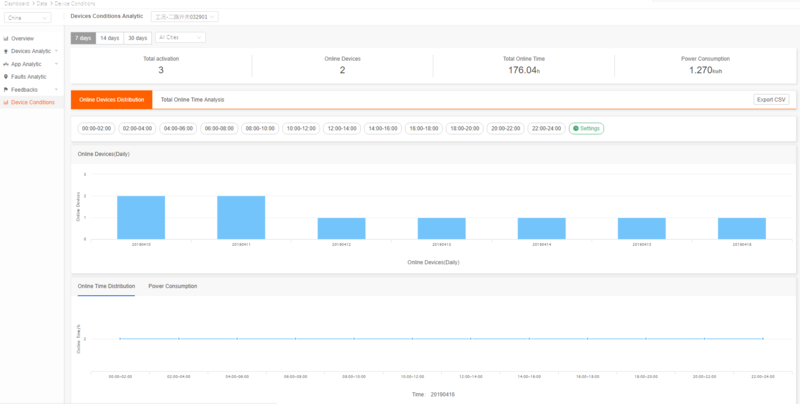 Yesterday New: indicates the number of faults that have occurred on devices under the current Tuya account and were reported on the previous day. Problems that users report are classified into product problems and app problems (related to the OEM app, Tuya Smart, and Smart Life). Feedbacks displays processed and to-be-processed problems, app versions, and products, helping you quickly locate problems that occur during product or app use and efficiently optimize your products and services. Total Feedbacks: indicates the total number of times that users report feedback through apps. Product (under Total Feedbacks): indicates the number of times that users report product-related feedback through apps. App (under Total Feedbacks): indicates the number of times that users report app-related feedback through apps. To be processed: indicates the number of feedback messages to be processed. Product (under To be processed): indicates the number of product-related feedback messages to be processed. App (under To be processed): indicates the number of app-related feedback messages to be processed. Today New: indicates the number of feedback messages that users reported through apps on the current day. Yesterday New: indicates the number of feedback messages that users reported through apps on the previous day. Product Feedbacks chart: shows the trends for daily product-related feedback over a specified time. App Feedbacks chart: shows the trends for daily app-related feedback over a specified time. Product Feedbacks displays information about the problems that consumers encounter during product use, including the number of all and new problems, the number of to-be-processed problems, feedback distribution, and feedback handling time, helping you analyze the feedback from multiple aspects and improve product quality and user experience. Product Feedbacks pie chart: shows percentages of product problems that users report through apps during a specified period to all product-related feedback messages. Processed Duration Distribution chart: shows the numbers of product problems for a specified time that require specific amounts of time to solve. [a] View the number of all and new problems and the number of to-be-processed problems. [b] Click To handle to quickly go to Operation > Feedback and communicate with the customer for a solution. [c] View the feedback distribution within 7 days, 14 days, or 30 days. [d] Select All status, Processed, or Not Processed to check related feedback statistics. [e] View the number of product problems for 7 days, 14 days, or 30 days that require specific amounts of time to solve. App Feedbacks displays information about the problems that consumers encounter during app use, including the number of all and new problems, the number of to-be-processed problems, feedback distribution, and feedback handling time, helping you analyze the feedback from multiple aspects and improve your app and user experience. For example, after receiving a large number of app problems, you can check the App chart on the page to locate the app version. For example, you may find that most problems occur in version 2.1. Then you can send the information to the R&D personnel to help quickly solve the problems and upgrade the app. App pie chart: shows percentages of app problems that users report through apps during a specified period to all app-related feedback messages. Processed Duration Distribution chart: shows the numbers of app problems for a specified time that require specific amounts of time to solve. 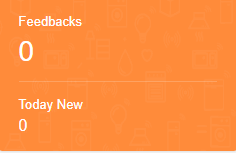 Operations on the App Feedbacks page are similar to those on the Product Feedbacks page and are not described here. Total activation: indicates the total number of activated devices that belong to the selected product. Total Online Time: indicates the cumulative amount of online time of devices that belong to the selected product within 7 days, 14 days, or 30 days. Power Consumption: indicates the cumulative amount of power consumption of devices that belong to the selected product within 7 days, 14 days, or 30 days. Online Devices chart: shows the number of daily online devices that belong to the selected product within 7 days, 14 days, or 30 days. Online Time Distribution chart: shows the trends for daily online time of devices that belong to the selected product over 7 days, 14 days, or 30 days. Power Consumption Distribution chart: shows the trends for daily power consumption of devices that belong to the selected product over 7 days, 14 days, or 30 days. Online Time Distribution chart (city-based): shows the city-based cumulative amounts of online time of devices that belong to the selected product within 7 days, 14 days, or 30 days. Power Consumption Distribution chart (city-based): shows the city-based cumulative amounts of power consumption of devices that belong to the selected product within 7 days, 14 days, or 30 days. When you click Export CSV on the Online Devices Distribution tab page, you need to select a time segment to control the amount of exported data. If you choose China and need data for all cities, province-based data will be exported. If you choose the United States or Europe and need data for all cities, the data will be exported based on the country or region. If you only need the data for a Chinese province, the United States, or a European country, city-based data will be exported. When you change the city, the device conditions data in the top banner area of the page will not change, but the charts will.